Everybody loves a good deal right?! Now, don’t get me wrong, I love splurging every once in a while on a great designer bag or pair of shoes that will last me forever. BUT sometimes there are pieces that you just want for a season without spending a pretty penny. 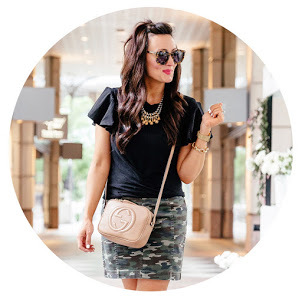 Now a days, there are so many great look-a-likes for high end designer pieces that it’s easy and affordable to create a chic stylish look for less. I’ve rounded up some of my favorite “dupes” for the fall season, so I thought I would share them with you! 4.) A good fall lip – One of my favorite things about fall is adding a berry red lip with all the fall colors in my wardrobe. It’s the perfect way to finish the look. You know I love my Charlotte Tilbury lip colors (“Red Carpet Red” is a great berry color for fall), but if you don’t want to splurge on a lipstick for over $30, Rimmel 107 is a great drugstore berry red option for under $6! 5.) Everyone needs a classic sparkle stud earring for everyday wear. These ones are my GO-TO everyday earrings (besides my pearls) that I wear all the time! They are such a steal for only $19 and great for those days when you don’t want to worry about your accessories but still want to add some sparkle to your look. 6.) This Chloé bag is A-MAZING but it’s over $1500. I recently got this genuine leather look-a-like one in the taupe color and it doesn’t disappoint! It looks almost identical! Sometimes a girl needs a good dupe – this is mine. See?! Anyone can dress designer chic thanks to some of these amazing dupes for fall.